September was the cruelest month for the Council on American-Islamic Relations (CAIR), whose dirty laundry repeatedly made news. Just as CAIR was releasing a report that smears its opponents as bigots, the Justice Department's inspector general underscored the group's ugly track record by censuring FBI field offices for engaging CAIR in outreach despite a ban on such interactions due to its links to Hamas. Will greater isolation result? More damaging was a Daily Caller exposé of how CAIR uses "multiple corporate entities that conceal the large financial donations that come to CAIR from Middle East sources," including governments, in a shell game that appears to violate U.S. law. So much for CAIR's claim to speak for American Muslims. Al-Shabaab's Kenyan mall massacre also created headaches for CAIR. Rumors that Americans were among the attackers sparked recollections of how CAIR had slammed critics of al-Shabaab and impeded investigations into the terror gang's recruitment of Muslims in the U.S. Regarding the possibility that Muslim Americans had participated in the bloodshed, spokesman Ibrahim Hooper offered this observation: "Who cares?" In yet another September embarrassment, it was revealed that representatives of Sudanese dictator Omar al-Bashir had "met with [CAIR executive director Nihad] Awad during the 2009 UN summit seeking his help to gain access to individuals in the Obama administration." This occurred eight months after Bashir was charged with crimes against humanity. Left: Nihad Awad compared al-Shabaab terrorists to "advocates of Islamophobia." 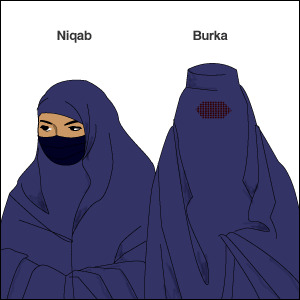 Right: Niqabs are seen — and will continue to be seen — at Birmingham Metropolitan College. In a retreat described as "humiliating," Birmingham Metropolitan College (BMC) lifted a ban on face-blocking apparel days after the policy was publicly exposed. Muslims alleged discrimination upon learning that garments such as face veils (niqabs) were not welcome because everyone must be "identifiable at all times." The principal explained that the goal was a secure and friendly campus, but these concerns went out the window once local politicians blasted the rule and activists registered their outrage. "We will modify our policies to allow individuals to wear specific items of personal clothing to reflect their cultural values," BMC announced. The reversal parallels one by the Massachusetts College of Pharmacy and Health Sciences in 2010. The administration had directed that "any head covering that obscures a student's face may not be worn, either on campus or at clinical sites, except when required for medical reasons," but as the press got wind of it and Islamists turned up the heat, the college quickly exempted religious garb. Note, however, that other schools, including ones in the UK, Canada, and Sweden, have exhibited less patience for the niqab and less susceptibility to pressure. Rulings by Judge Peter Murphy further disappointed British foes of the face veil. Having initially refused to accept a plea from a niqab-clad woman because he could not identify her, Murphy later allowed her to show her face in private to a female police officer who had photographed her in custody and thus could verify that it was the same person. He then agreed to another compromise that will permit the accused to remain veiled during the trial except when she is testifying. At that time a barrier will be erected to shield her from everybody but the judge, attorneys, and jurors, who must be able to see her face to evaluate her evidence. Both the BMC kerfuffle and Murphy's decisions have fueled much debate about the face veil in Britain. As discussed in a 2012 IW article, judges often have limited guidance for handling such demands for accommodation. Most reject the niqab during testimony, but at least one Danish judge has consented to it. Also note that walling off a temporarily unveiled woman has been tried before in the UK. Murphy urges higher authorities to "provide a definite answer to the issue soon" — something that the Supreme Court of Canada failed to do in its recent ruling on niqabs. Left: The woman at the center of the row over courtroom concessions. Right: Nidal Hasan's non-regulation beard was tolerated at his trial, but he was forcibly shaved afterward. Following an expensive court-martial delayed by a dispute over facial hair, Fort Hood murderer Nidal Hasan has been sentenced to death and dishonorably discharged from the U.S. Army, meaning that his handsome salary has finally been terminated. Though Hasan's guilt was never in doubt, many had hoped that the trial would prove useful by underlining his jihadist ideology, which the government has whitewashed for years. However, the judge refused both Hasan's request to argue that he had acted to defend Muslims and the prosecution's request to present evidence of his motives. By running Hasan's Islam-infused press statements and highlighting the self-imposed blindness that served as his accomplice, the media did the job that the trial did not: Mother Jones recapped federal bungling "reminiscent of the intelligence failures prior to the 9/11 attacks." Fox News aired the first video clips of Hasan's 2007 lecture that radiated radicalism yet prompted little response. Most striking of all, the Los Angeles Times published evaluations from Hasan's superiors praising his "outstanding moral integrity" and noting that his "keen interest in Islamic culture and faith" had driven research with "extraordinary potential to inform national policy and military strategy." Political correctness is rampant in the armed forces — and, yes, it can kill.